Hi everyone! 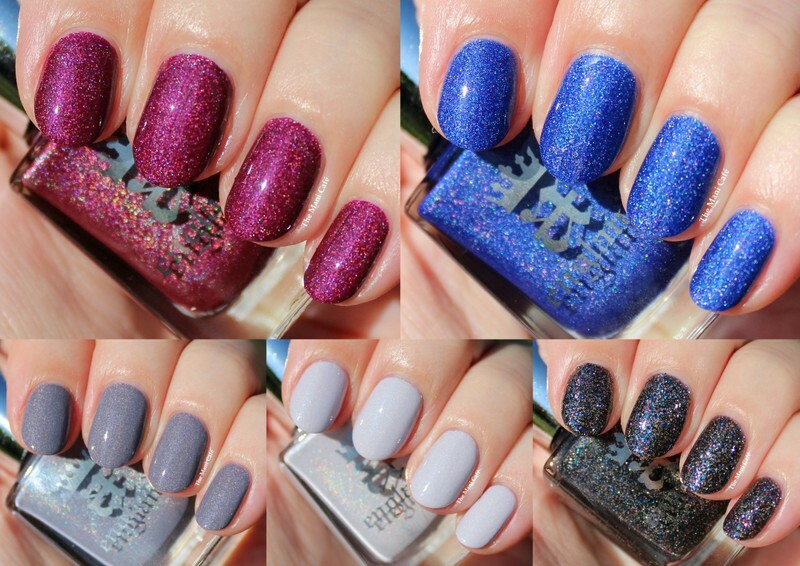 Today I have swatches of the gorgeous new A England collection to show you! To Emily Brontë is a collection inspired the the author and her novel Wuthering Heights. I was sooooo excited to try these, as with all A England collections. As usual, I was not disappointed by Adina's inspiration, creativity and formulas. So let's get started with these pretties! My absolute favourite of the collection. I'm in love with the colour and the velvety holo. This is a very 'me' colour and I know I will wear it a lot. I used 2 coats and topcoat. Excellent formula and application. This one goes on like butter and almost a one-coater. Another favourite for me. I love a good blue polish and find this one very flattering for my skin tone. The holo is sparkly and unique in my collection. I used 2 coats and topcoat. Again, excellent formula and application. I knew I was going to like this one when I saw the first pictures of it, but it is even better in person! A gorgeous purple-toned grey with a hint of holo. I used 2 coats and topcoat. Perfect formula and application. One of the shades I was most excited about. The blue shimmer is stunning though hard to capture in photos. I can see myself wearing this a lot, alone and as a base for nail art probably too. Formula and application were good. Slight dragging on the first coat but the second coat evened everything out perfectly. Slightly longer drying time than the others but to be expected with a light coloured shimmer polish. A jelly black base with silver, red and blue microglitter. I used 2 coats with no undies. You could also apply this over black for a deeper black finish. I used a coat of gel effect topcoat for a smooth finish. As usual, Adina has come up with a stunning collection. I love the variety and the finishes. As I expected, Let Me In is my favourite along with Cathy. I'm a sucker for a good berry or shimmer! OMG they are sooo gorgeous!!! Great swatches! Thank you! I agree, they're awesome! Some great looking polishes from A England you showed here. Oooh A England polishes are soo pretty. I always drool over the pics. I love that lavendar gray holo. :) thanks! I love that one too! Absolutely gorgeous swatches and photos! Now I need these when I thought I didn't!